One beautiful thing I inherited from my parents (Happy day after Mother’s Day, mom!) is my love of reading. Favorite books are like old friends. There are certain reads I can return to time and again and never feel like I stop learning (Anne of Green Gables series, anyone?). But of course, I always love finding new favorites too, and I want to share my most recent crop with you. Single most efficient way to assemble a baller reading list? Ask your brilliant book-lovin’ friends for their recommendations! In one 24-hour span and one question on the book of Face, I had an epic thread of incredible reads. Here are those that I’ve gotten through so far and a few more that I can’t wait to pick up. *The ones I’ve read in the last couple of months all happen to be non-fiction books, which is surprising for me–my hubby is the non-fiction reader in our household. However, if you’re skeptical of non-fiction, this fiction-loving girl PROMISES you that these are worth your while. 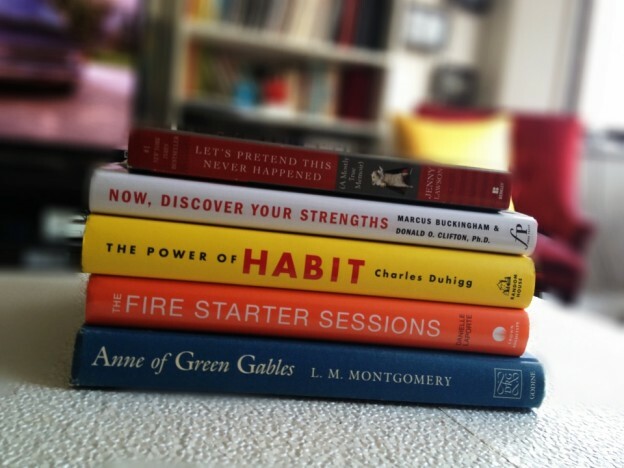 The Power of Habit by Charles Duhigg–Ever wonder why we do the things we do? The brain science behind habit, habit forming, and habit changing (’cause Mr. Duhigg informs us with great scientific authority that you can’t BREAK a habit–you can only change it to something better or replace it) is absolutely fascinating! Now Discover Your Strengths by Marcus Buckingham and Donald O. Clifton, Ph.D.–In my continuing self-actualization quest, this book was a really fun tool. Ever thought “I’m not good at anything” or even “What I’m good at isn’t meaningful/important/cool?” These fellas are here to tell you that you ARE good at things, and that when you stop dwelling on your weaknesses, those specific strength areas have a lot to offer the world. I found the quiz scarily and exhilaratingly accurate. The Firestarter Sessions by Danielle LaPorte–I started following Danielle a long time ago; she is one feisty, brilliant, genius truth-teller. Not a book to read if you like the status quo. However, if you’re itching in your current situation and ready to embrace your OWN genius, she’ll help illuminate the way. Let’s Pretend This Never Happened by Jenny Lawson–I’m late to the party on discovering the brilliance of The Bloggess, but I’m happy to have arrived when I did. I actually started reading this on the plane to China and had to put it down until I was not surrounded by people–because I was laughing so hard and trying so hard NOT to make too much noise that I almost choked. Tears streaming down my face CHOKING on hilarity. Jenny Lawson’s memoir of growing up in rural Texas is a must read. Half the Sky: Turning Oppression into Opportunity for Women Worldwide by Nicholas D. Kristof and Sheryl WuDunn–This book will pick you up, spin you around, and set you down with a whole new perspective on the world. Nicholas and Sheryl are NY Times reporters who have made it their mission to illuminate the challenges facing women around the world. That the things they talk about still go on in 2013 will shock you and piss you off and hopefully motivate you to get involved. Tiny Beautiful Things: Advice on Love and Life from Dear Sugar by Cheryl Strayed–These are some the most startlingly honest, heartbreakingly loving, soul connected words I’ve ever read. A series of advice columns–questions and answers: but SO. MUCH. MORE. Thank you, Cheryl. Happy Reading! Let me know how they turn out . . .